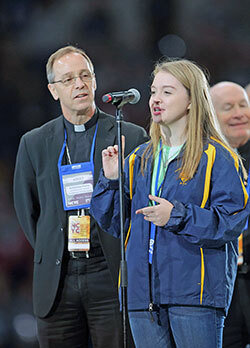 Archbishop Charles C. Thompson smiled as he considered the energy and the enthusiasm of 20,000 young Catholics from 125 dioceses across the country coming together to embrace their faith. “Young people are like anyone else. They’re looking for a sense of meaning, a sense of purpose in their lives,” the archbishop said as he stood amid the whirlwind of the Indiana Convention Center, one of the main sites of the National Catholic Youth Conference in Indianapolis on Nov. 16-18. Archbishop Thompson was one of about 30 bishops who attended the conference in Indianapolis, after a busy few days of meetings with the U.S. Conference of Catholic Bishops earlier in the week in Baltimore. The extra effort to be in Indianapolis was more than worthwhile to Archbishop Paul D. Etienne of Anchorage, Alaska. “I want to do all that I can to build a relationship with our youths so they know of my support for them,” said Archbishop Etienne, a former priest of the Archdiocese of Indianapolis who also served as the bishop of Cheyenne, Wyo. Archbishop Etienne shared his comments shortly after witnessing the enthusiasm of the 20,000 youths in an early morning faith gathering at Lucas Oil Stadium on Nov. 17. Hope also drew Bishop Christopher J. Coyne of the Diocese of Burlington, Vt. He noted that this was the first time that a group of youths had come from Vermont for the national conference. “A lot of our young people are kind of adrift,” said Bishop Coyne, former auxiliary bishop of the Archdiocese of Indianapolis. “So anything that can get them active in a good way within the faith and within the Church is good. And NCYC sure can do that. You’re with so many other young people and adult chaperones and people with beliefs, and you hear great talks and wonderful music. Simple math and an opportunity for connection led to the presence of Bishop William F. Medley of Owensboro, Ky., at the conference.